Objective To evaluate serum potassium levels and rates of hypokalaemia in patients treated with liquorice-containing Japanese traditional Kampo-medicines Yokukansan (YK) and Yokukansan-ka-chinpihange (YKCH). Setting Patients receiving YK preparations for dementia and other psychiatric disorders in the University of Tsukuba Hospital in Japan. Participants 389 patients (male/female: 174/215, 68.6±16.1 years) were treated with YK preparations for 231 days (range 6–2788 days). Patients whose potassium levels were <3.6 mEq/L before administration of YK preparations, and drug non-compliant patients, were excluded. Main outcome measure The occurrence rate of hypokalaemia and assessment of the risk factors for YK preparation-induced hypokalaemia. Results Of the 389 patients treated with YK preparations, 94 (24.2%) developed hypokalaemia (potassium levels <3.6 mEq/L) 34 days (range 1–1600 days) after administration of the preparations. 36 (38.3%) patients had co-administration with lower potassium-inducing drugs (LPIDs; diuretics, glucocorticoids, mineralocorticoids and glycyrrhizin), which was more frequent in the patients without hypokalaemia (17.3%) (p<0.05). A Cox proportional hazard model identified four risk factors for hypokalaemia: YK administration (not YKCH) (HR 3.093, 95% CI 1.408 to 6.798), co-administration of LPIDs (HR 2.743, 95% CI 1.754 to 4.289), hypoalbuminaemia at baseline (HR 2.145, 95% 1.360 to 3.384), and full dosage administration (7.5 g/day) (HR 1.600, 95% CI 1.005 to 2.549). Conclusions Serum potassium monitoring should be done at least monthly in patients with the following risk factors: LPID co-administration, YK administration, hypoalbuminaemia, and full dosage administration. This is the first report to identify the risk factors for hypokalaemia as an initial symptom of pseudoaldosteronism in patients treated with YK preparations containing small amounts of glycyrrhiza (1.5 g/day). Patient data, including backgrounds and laboratory data, are under the sole stewardship of the University of Tsukuba Hospital. Since this is a retrospective cohort study, blood sampling intervals for assessing serum potassium and other laboratory data were not fixed. In the present study, we retrospectively investigated the change in serum potassium levels in patients treated with YK preparations to assess the risk factor for hypokalaemia as an initial symptom of pseudoaldosteronism. YK preparations (YK and YKCH) were obtained in a commercially available granule form (Tsumura & Co, Tokyo, Japan), prepared from a mixture of seven and nine crude drug extracts, respectively (table 1). These traditional medicines are approved for medical use in Japan. The daily dose of both YK preparations is 7.5 g/day as the granule, which contains a dried extract of the mixed crude drugs of YK (3.25 g) or YKCH (4.5 g) as shown in table 1. The glycyrrhiza content for both YK and YKCH was the same as the daily dose extracts (1.5 g) (tables 1 and 2). Three hundred and eighty-nine patients (174 males and 215 females, mean±SD age 68.6±16.1 years) receiving YK preparations for BPSD or other psychiatric disorders were enrolled at the University of Tsukuba Hospital from March 2007 to January 2016 (table 3). One hundred and eighty-four patients were treated as outpatients and 205 were admitted during the trial. Three hundred and twenty-three patients were treated with YK and 66 with YKCH for 231 days (range 6–2788 days). YK preparations were given orally before or after meals at full dose strength (2.5 g three times a day; 7.5 g/day) or a reduced dose (2.5 g once or twice a day; 2.5–5.0 g/day) based on patient symptoms; 229 patients (58.9%) received a full dose of YK preparation. Non-compliant patients as well as those whose pre-administration serum potassium level was <3.6 mEq/L were excluded from the study. Changes in laboratory data, including serum potassium, sodium, chloride, aspartate aminotransferase, alanine aminotransferase, blood urea nitrogen, serum creatinine and albumin, and co-medication were retrospectively investigated via medical records before and after administration of YK preparations. Statistical parameters were ascertained using SPSS software (International Business Machines Corp, Armonk, New York, USA). Statistical analyses were performed by the Mann-Whitney test and χ2 test for comparing differences between hypokalaemic and non-hypokalaemic groups. The cut-off threshold for hypokalaemia was determined by a receiver operating characteristic (ROC) curve. Intergroup differences in patients treated with and without lower potassium-inducing drugs (LPIDs; diuretics, glucocorticoids, mineralocorticoids and glycyrrhizin preparations) were analysed by the Kaplan-Meier method. A Cox proportional hazard model was employed to identify risk factors for hypokalaemia. A value of p<0.05 was considered to be statistically significant. Ninety-four patients (24.2%) developed hypokalaemia (potassium levels <3.6 mEq/L) during the study period (table 3). The median time to develop hypokalaemia was 34 days (range 1–1600 days) after administration of YK preparations (table 3) at which the cumulative rate of hypokalaemia was 12.7% by Kaplan-Meier analysis (figure 1). 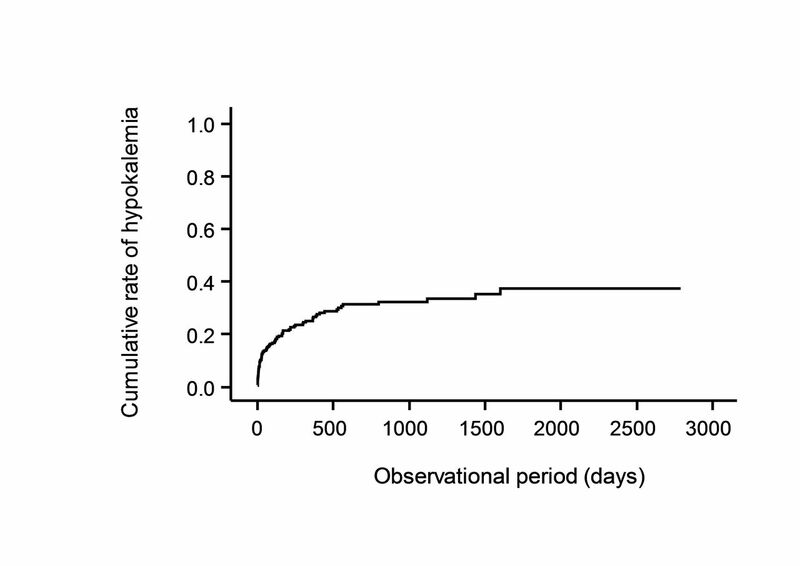 Cumulative rate of hypokalaemia after administration of Yokukansan (YK) preparations. Significant differences between hypokalaemic and non-hypokalaemic patients were observed and attributed to the type of drug used (YK or YKCH), the dosed amount, and dosing period. Compared with the non-hypokalaemic group, the hypokalaemic group received YK more often than YKCH (91.5% vs 80.3%) as well as more full dosing amounts (70.2% vs 55.3%, p<0.05) (table 3). The dosing period in hypokalaemic cases was significantly shorter than in non-hypokalaemic cases (169 days, range 8–2280 days vs 266 days, range 6–2788 days, p<0.05) (table 3). Of the patients with hypokalaemia, 36 (38.3%) were receiving concomitant doses of LPIDs, which was more frequent in the patients without hypokalaemia (17.3%) (p<0.05) (table 3). Mean serum potassium at baseline in the hypokalaemic group was also lower than in the non-hypokalaemic group (p<0.001), even though their values were within the normal range. The reduction for serum potassium (∆ potassium) after administration of YK preparations was pronounced in the hypokalaemic group compared with the non-hypokalaemic group (−0.7, −3.0 to −0.1 mEq/L vs −0.1, −1.3 to 1.1 mEq/L, p<0.001) (table 3). Hypokalaemic patients more often displayed abnormal values of alanine aminotransferase, albumin and blood urea nitrogen at baseline than the non-hypokalaemic group (14.9% vs 9.8%, 50.0% vs 29.2% and 39.4% vs 26.4%, respectively, p<0.05). A higher rate of hypoalbuminaemia (albumin <3.8 g/L) was also observed in hypokalaemic patients (45.7% vs 28.8%, p<0.05), with concomitant minimum potassium levels during the administration of YK preparations (data not shown). A Cox proportional hazard model based on univariable and multivariable analysis identified four risk factors for YK preparation-induced hypokalaemia: YK administration (not YKCH) (HR 3.093, 95% CI 1.408 to 6.798), co-administration of LPIDs (HR 2.743, 95% CI 1.754 to 4.289), hypoalbuminaemia at baseline (HR 2.145, 95% CI 1.360 to 3.384), and full-dose administration of YK preparations (7.5 g/day) (HR 1.600, 95% CI 1.005 to 2.549) (table 4). On the other hand, baseline potassium levels ≥4.1 mEq/L, established as the optimal threshold to predict non-hypokalaemia, were a reverse risk factor for hypokalaemia (HR 0.450, 95% CI 0.288 to 0.702) (table 4). To assess the effects of LPIDs co-administration on the occurrence of hypokalaemia, the time between administration of YK preparations and development of hypokalaemia was compared between groups with and without LPIDs (figure 2). 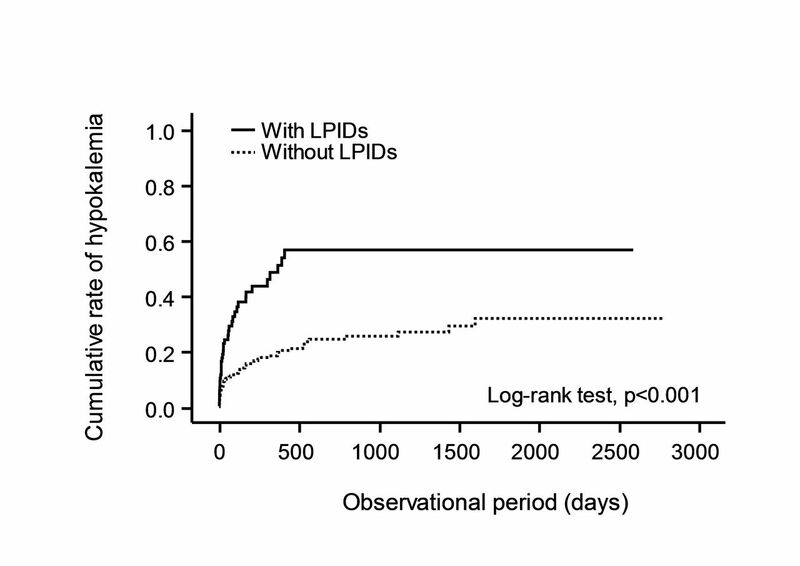 Patients treated with concomitant LPIDs showed a shorter time-to-occurrence for hypokalaemia than those without concomitant LIPDs (p<0.001) (figure 2) . Effects of LPIDs co-administration on occurrence of hypokalaemia in patients treated with YK preparations. Solid line: patients co-administered with LPIDs; dotted line: patients without LPIDs co-administration. A significant difference was observed between patients with and without LPIDs co-administration in the log-rank test (p<0.001). LPIDs, lower potassium-inducing drug; YK, Yokukansan. Nine patients discontinued YK preparations due to hypokalaemia and each had the risk factors indicated in table 5. Seven patients (except for cases 4 and 7) had multiple risk factors. Cases 1 and 2 developed severe hypokalaemia, with potassium levels <2.1 mEq/L, and were found to have been co-administered a thiazide diuretic or presented with rhabdomyolysis, respectively (table 5). We found four risk factors associated with hypokalaemia in patients with heterogeneous clinical backgrounds (table 4). The risk of hypokalaemia during YK treatment was 3.09 times higher than that of YKCH (table 4). One possible explanation of this finding may be due to the difference in GL content between YK and YKCH, even though the glycyrrhiza content is the same (1.5 g/day) as shown in table 1. Kampo-medicines, including YK preparations, are spray-dried herbal extracts (table 1). A mixture of seven or nine crude drugs are added to water and boiled, filtered, concentrated and then the resulting decoctions are further spray-dried to yield the extract for making YK preparations. In this manufacturing process, the wet extraction rate of GL may differ between YK and YKCH due to variations in the combination of crude drugs and the pH value of their decoctions.28 A resultant higher GL content for YK might therefore present a higher risk of hypokalaemia compared with YKCH. Patients co-administered with LPIDs were 2.74 times more likely to develop hypokalaemia (table 4, figure 2) and experience a shorter time-to-onset compared with YK preparations alone (figure 2). Among the LPIDs, loop and thiazide diuretics attract special attention because they are frequently prescribed for dementia patients with hypertension (data not shown). Severe hypokalaemic cases with low potassium levels of 1.9 mEq/L had received thiazide diuretics concomitantly (table 5). Patients with hypoalbuminaemia had a 2.15 times higher rate of hypokalaemia (table 4). Since 99.9% of circulating GA are bound to albumin,29 hypoalbuminaemia may increase the unbound fraction of GA through pharmacokinetic alteration, resulting in an enhancement of the pharmacological actions of GA. Yoshino and colleagues have suggested that hypoalbuminaemia was a risk factor for pseudoaldosteronism in three other Kampo-medicines.30 The present results are the first to report that hypoalbuminaemia is a possible risk factor for liquorice-induced hypokalaemia due to YK preparations. The occurrence of hypokalaemia might be dose dependent in patients treated with YK preparations because full-dose YK preparations (7.5 g/day) increased the risk more than 1.60 times compared with a reduced dose (table 4). This observation is consistent with previous reports suggesting that liquorice-induced pseudoaldosteronism was found in a dose-dependent manner.20 21 Since a majority of the dementia patients taking YK preparations were elderly, the reduced dose is recommended for any patients with risk factors for pseudoaldosteronism. Although age was not identified as a risk factor for hypokalaemia in the present study, this might be due to a lack of comparison, as most of the patients investigated were elderly (mean age 68.6±16.1 years old). Initiation of full-dose YK preparations should therefore be avoided in elderly patients whose 11β-HSD activity might be low due to an age-dependent decline in kidney function.31 In fact, seven of nine patients who discontinued YK preparations due to hypokalaemia were over 70 years old and had multiple risk factors for hypokalaemia (table 5). Hypokalaemia was found at an unexpectedly high rate in patients receiving treatment with YK preparations, even though the liquorice content was relatively small. Four risk factors were found to be important in elderly patients receiving long-term treatment with YK preparations: YK versus YKCH administration, LPIDs co-administration, hypoalbuminaemia, and full dosage administration (7.5 g/day). It is recommended that serum potassium monitoring should be done at least monthly for the safe use of YK preparations in patients with multiple risk factors. We gratefully acknowledge Drs K Doki, T Hosono and Y Suzuki for their useful advice and discussions. We would also like to thank Dr Bryan J Mathis of the Medical English Communication Centre (University of Tsukuba) for proofreading this article.
. Psychiatric pharmacology: study of the clinical efficacy of yokukansankachimpihange on Alzheimer's disease. Psychiatry 2009;14:535–42.
. Effect of yokukansankachimpihange on dementia including the point of view of oriental medicine. Psychiatry 2011;18:108–14. Information of the package insert of YK preparations, Tsumura Kampo Square [Internet]. Tokyo: Tsumura & CO. Tsumura Kampo Square; 2009-2016. http://www.tsumura.co.jp/password/m_square/products/ichiran/index.htm. (accessed Jul 7 2016).
. Adverse drug reaction frequency investigation of TSUMURA yokukansan extract granules for ethical use. Diagnosis Treat 2014;102:1577–89.
. Licorice-Induced pseudoaldosteronism; Hypertension, hypokalemia, aldosteronopenia, and suppressed plasma renin activity. JAMA 1968;205:492–6. Issued by the Pharmaceutical and Supply Bureau, Ministry of Health and Welfare [Internet]. Tokyo: Japanese Ministry of Health and Welfare, 1978. http://www.japal.org/contents/19780213_158.pdf. (cited Jul 7 2016).
. Analysis of adverse reaction in kampo-medicines using JADER database of PMDA. Iyakuhin Johogaku 2014;16:16–22.
. A clinical effect of Yi-Gan San in elderly patients. Jounal Kampo Med 2008;55:1311–23.
. The Pharmaceutical Society of Japan. 136th annual meeting of the pharmaceutical society of Japan; 2016 Mar 26-29. Yokohama, Japan. Contributors SS, TA, AT and MH designed and supervised the study. TA and AT selected the patients for this study. SS and MH corrected the data and carried out statistical analyses. SS and MH drafted the original manuscript and all authors checked and revised the manuscript. SS and MH are the guarantors. Patient consent This is an observational study that does not require written consent to be obtained from each patient. The study design was described on a web page which patients can access from our hospital home page. If the patients do not want to attend the study, they can inform us of their intentions. Ethics approval The Ethical Committee of the University of Tsukuba Hospital. Data sharing statement The full dataset is available from the corresponding author.